So here’s yet another cube map pack for all you 3D game art enthusiasts out there. This is processed in a similar manner as my other cube map pack but it’s 512px on mip lvl 0 instead of 1024px. I find this will work good enough for reflections and ambient lighting. Also bandwidth when hosting is an issue. 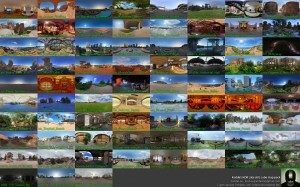 All the source images used to create these cube maps I got from HDRLabs.com sIBL archive. They are licensed under the Creative Commons Attribution-Noncommercial-Share Alike 3.0 License. Check the bundled readme.txt for further details. These cater directly to my Maya CGFX shaders as they have pre-blurred mips for altering reflection and ambient blur amount, but I’m fairly certain that others might find this useful as well. There’s 77 cube maps in this pack stored in different sub folders based on their source image origin. The preview sheet included in the bundled. © 2013 kostas.se. All images are copyrighted by their respective authors.